Do you already have enough weapons in Destiny? Of course not, because new expansions bring more and new guns. 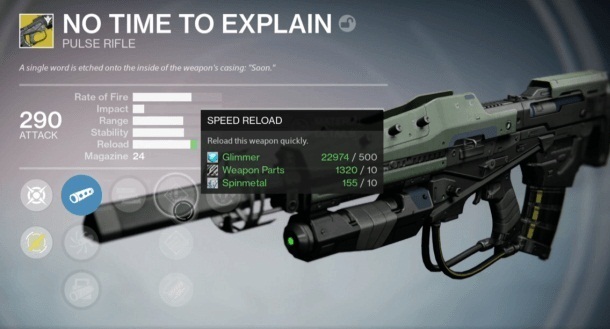 This time we introduce you to a new pulse rifle called "No Time to Explain". Once again you have put some efforts in order to acquire the new weapon. 1. Start the secret quest Paradox as a Daily Heroic Mission, otherwise you will not get the spirit / ghost out of the chest. 2. Collect the three hidden Ghosts in the transparent chamber. 3. Pass through the portal, killing all possessed complex and loot the chest at the end of the mission. 4. From this you get the Cult Ghost and legendary brands as a bonus for completing the Daily mission. Go to Lakshmi-2 with the Cult Ghost, loitering in the hangar of the tower. Then follow the quest with the title "Not Forged in the Light." Don’t worry if you don’t get the same quest, it can be quite some time after delivery of the cult ghost. Next, you need to set in the Future War Cult. Remember to apply the corresponding group badges and let the group get donations by material exchange. With light particles that goes fastest as you can fill these more quickly. 1. Defeat a taken Minotaur with yellow life bar. These can be found for example at public events on Venus. 2. This leaves you in passing a simulation behind core, you need to disassemble them in your inventory. 3. Back in the tower, now Lakshmi-2 sends you into the Vault of Glass chamber where you must defeat Atheon. 4. From him you get the legendary Eye of Atheon, whom you also dismantled in inventory at success. You will be returned to Lakshmi-2, you can now activate the mission Shadow at Twilight. In the crucible map it is now a case to find the chest which is randomly hidden somewhere. From it you get the bracelet from Ana Bray, which you can bring to Lakshmi-2 and she will give you the last part of the quest chain. Top with a team of three players you put yourself to the last mission of blood of the Garden of Venus. Now you must kill as many enemies as possible. At full bar of Endboss, the court guards appear. Completed this Minotaur and keep your anger at 100%. After success you can finally return to Lakshmi-2 and take your well-deserved No Time to Explain weapon. With the exotic land Pulse Rifle cartridges, which convert it into precise results such as headshots, directly back to your magazine. Unerring guardians can thus save a lot of ammunition and well-positioned for raids.